Every parent remembers the day they first left their child into care with someone else. This is not an easy thing to do, but sometimes it is a necessity. In the following lines, parents living in Potong Pasir, Singapore, are offered with a list of near-by, reliable, and trust-worthy child care centers. This child center is at the very top of care and education providers in the Potong Pasir, Singapore. The key to their success is approaching every child as an individual, and supporting the development of its potential to the fullest. This is realized with joint efforts of experienced child care workers, who closely cooperate with the parents. Cherie Hearts offers different levels of care and includes preschool, infant care, playgroup and pre-nursery, nursery and kindergarten. Each level is accompanied by age-appropriate activities and learning modules. Also, there are special enrichment programs, such as SPIRAL Literacies Curriculum. The services provided include full day, half day morning, and half day afternoon. Amar Kidz at Potong Pasir, Singapore, is one of the dedicated child care providers, committed to preparing a child for life-long learning. Their basic philosophy is to provide holistic care for the child, nurture a close relationship with the parents, and strive to elevate the overall level of education so that the future community members are made of intellectuals, as well as kind and responsible individuals. In order to do so, Amar Kidz works with the Early Childhood Developmental Agency (ECDA), and with the Ministry of Social and Family Development. Programs offered include discovery babies, ready tots, empowered bloomers, achiever 5s, and motivated 6s. All programs follow the same guidelines – dream, play, learn, achieve. 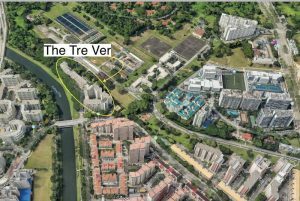 My First School is a child care center with a long tradition and it is very near to The Tre Ver Potong Pasir. Since 1977, it is constantly innovating, while preserving their core values. Honest love for children of the MFS’s staff resulted in creating a holistic approach, embedded with fun and interesting learning experiences. All of the teachers are qualified and fulfilled the training requirements set by the Early Childhood Development Agency (ECDA). Go to https://myfirstskool.com/ for more information or visit them at the address: 49, Whampoa South, Singapore 350134. For 16 years, Rainbow Cove provides education and care for children aged 18 months to 6 years around Potong Pasir, Singapore. Their gentle and understanding way of working with children led to the development of an exceptional level of care. This child care center is a part of globally-renowned learning program – Montessori education. The program is on a mission to nourish independence of every child, and offer nothing but respect for a child’s development in every sphere of existence. The bilingual program is also strongly supported at Rainbow Cove, held by native Chinese teachers who teach and converse with children on Mandarin on daily basis. The staff includes individuals with relevant diplomas in Early Childhood Care and Education, including a mix of local and foreign teachers.